Nothing and I mean nothing beats a classic Hot Toddy on a cold winter day and today, I'm going to share with you the proper recipe which uses Scottish Whisky. Pour the boiling water, whisky, honey, lemon juice and whole cloves into your mug of choice. Sprinkle with the nutmeg, then place the cinnamon stick in the mixture and put in the slice of lemon. 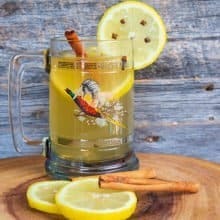 Let the hot toddy stand for 3-5 minutes so that the flavours can meld together nicely and the drink can cool enough to drink, then enjoy! There are many variations on this drink so feel free to play around with different spices until you find the perfect combination!